Jaipur – The Pink City, a city which caught our senses for the unthinkable amount of shopping we could do!! It all started with short, strenuous and instilling practice sessions to learn Mayuri’s Choreography “Kaali”. On night of May 8, at 23:00 we get a text message from Geetha asking us to report at the airport the next day. We were baffled as we thought we were to leave on 10th. There started the saga!! We reach Mumbai airport and wait for 4 hours to board the connecting flight. Oh boy! What a traveling day! I must say that we munched on most of the junk food possible at the airport. So we finally see the pink city at 20:00 on the 9th. We were taken to hotel Fairmont which exactly resembles the Mughal era architecture carved so passionately. We checked into rooms that were like a queen’s private chambers. 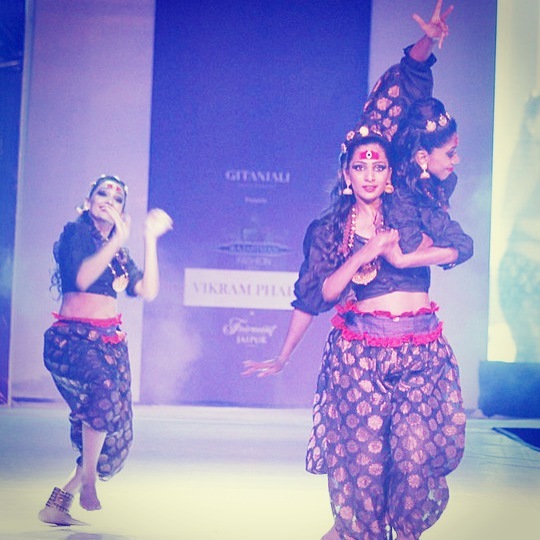 It was Rajasthan Fashion Week being celebrated and numerous designers and models adorning the event in style. We were invited to open the event for Vikram Phadnis, the theme of it being “The Girl Child”. Vikram Phadnis’ inspiration in this collection came from rural India. The collection was a mixture of colours from the sun to the soil. Bright oranges, reds, maroons teamed up with beiges, blacks and antique gold. I was especially delighted to see the quirky hairstyles teamed with the traditional anarkalis. They just looked “Wow”! We just got a glimpse of the stage on 9th midnight and couldn’t rehearse. Our show was scheduled at 13:00 on 10th. This was a little unusual since shows happen late evenings or nights. This was a fashion event happening day in and day out. We went around watching another fashion event which was happening with lot of celebrations outdoor. We then called it a day and hit our respective rooms. The next day morning we woke up to hit the stage for technical runs with the light wizard Lloyd. After few runs it was time for us to beautify and were pampered to professional makeup and hair styling. We met Ambika Pillai’s manager from Karnataka and were thrilled to hear someone conversing in our mother tongue and helping us around a lot. Another interesting incident was that we met a chef from Karnataka who helped us around with the native dishes being served. The show was delayed by hours together and started only by 17:00. 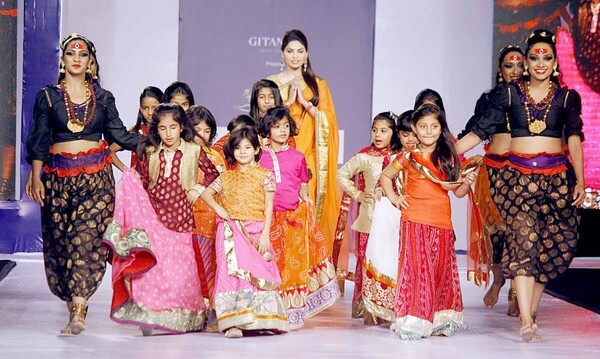 Mr Phadnis was so impressed with our practice session that he asked us to walk the ramp with the kids!! We were in Jaipur and we were done with the show soon. What do you expect? We booked a cab and went into the city to shop!! Shopping in Jaipur was a lovely experience even though it was for a short duration. The small shops selling traditional foot wear and jewellery were straight out of some story. We were up and got ready to pack and report at the lobby as were finally asked to report afternoon to leave to the airport. I and Latha went downstairs and checked out when we got a call from Madhuri asking us to get back to our rooms. We were doomed as the rooms couldn’t be retrieved and we still had our flights unreserved. Later, we had to wait in our rooms to receive a call telling we need to share rooms with other models. We waited in our rooms watching house of wax. We then got to know that our flight’s at 10:10 and were thrilled to get back. Moreover, I had to perform the next day morning at Christ University! Anyway we were glad that we would be back! On our way to the airport Madhuri realised that her photo id is missing! We had to contact the hotel reception, ask them to check the many rooms we had to change into. But luck wasn’t on our side and they couldn’t find it. We went on to request the officers at the airport who attested her ticket and let us board!! We had to wait in Mumbai for 4-5 hours to catch the next flight. We went to Shruti’s brother’s house in the middle of the night to catch some sleep! He got us garlic bread at 00:00 which was very sweet of him. Madhuri went to her aunt’s place in a cab just to find a woman cab driver ferrying her. The four of us had a taste of what life can actually give us at times. A totally jinxed atmosphere transformed into a blissful one when we saw Bangalore approaching! Jaipur was far more exciting than we ever imagined!! !